Born 22 January 1920 at 6 Parrish's Cottages, Five Elms Farm, Dagenham, London [registered in Rochford, Essex, March 1920]. To Herbert Henry and Florence (née Bixby). He attended Becontree Heath School.attended Becontree Heath School. Married to Victoria Welch [registered in Southampton, December 1951]. Died: 28 April 1999 in an Ipswich nursing home, aged 79 years 96 days [registered in Ipswich, April 1999]. Died following a heart attack, having battled Alzheimer's Disease and Prostrate Cancer. He is buried in Old Ipswich cemetery (left) on 7 May 1999. Height/Weight: 5' 8¼", 12st. 8lbs . England: Alf Ramsey Years - Graham McColl (Andre Deutsch Ltd 1998). Club(s) Began his career with Essex schools and Five Elms FC. 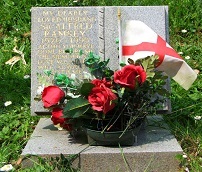 Also played Army football when he signed amateur forms with Portsmouth FC, whom he played for through the wartime. He went onto Southampton FC, signing amateur forms in 1943, turning professional in August 1944. He went on to play in ninety league matches, scoring eight goals before he joined Tottenham Hotspur FC in May 1949 for £21,000. Another 226 league appearances followed, and another 24 league goals, until his retirement in August 1955. Distinctions One of a handful of players who has a road named after him. 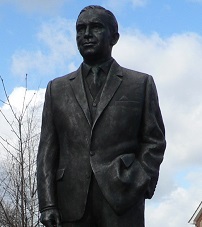 Sir Alf Ramsey Way runs alongside the Portman Road stadium, formerly named Portman Walk. Club(s): After retiring from playing, Ramsey immediately took up the management mantle at Ipswich Town FC on 8 August 1955. He remained in charge, with relative success until 29 April 1963. In his final season, 1962-63, he took charge of Town and England simultaneously. He remained manager of England until he was sacked in May 1974. He did not return to football straightaway, instead, only becoming consultant to Birmingham City FC, a position he resigned in March 1978, although he had become their director and for a time, caretaker manager. In 1979, he became a technical advisor to Turkish side. Panathinaikos FC. Afterwhich, he returned to England and into retirement. Player number One of five who became the 676th players (677) to appear for England. First match No. 244, 2 December 1948, England 6 Switzerland 0, a friendly match at Arsenal Stadium, Highbury, London, aged 28 years 314 days. Last match No. 284, 25 November 1953, England 3 Hungary 6, a friendly match at Empire Stadium, Wembley, London, aged 33 years 307 days. Distinctions Knighthood for services to football 1967; Sports Coach UK (formerly the National Coaching Foundation) Mussabini Medal and Coaching Hall of Fame 1998; Football Association Hall of Fame 2002. In the fantasy world, Sir Alf became the caretaker manager of Melchester Rovers FC in Christmas 1981. Although he only held the position for a few matches, few could honestly fill the boots of Roy Race after he had been shot. Alf himself contributed a few articles to the Daily Mirror throughout the 1980's, but eventually, ill-health took a hold. - An English Football Internationalists' Who's Who. Douglas Lamming (1990). Hatton Press, p.202/Various Media. Note that the 1949-50 records of the World Cup and British Championships are duplicated, and one set is therefore deducted from the grand total.